We left Stewart Island on the 8am ferry the following morning under blue skies and a strong wind (probably Force 7). 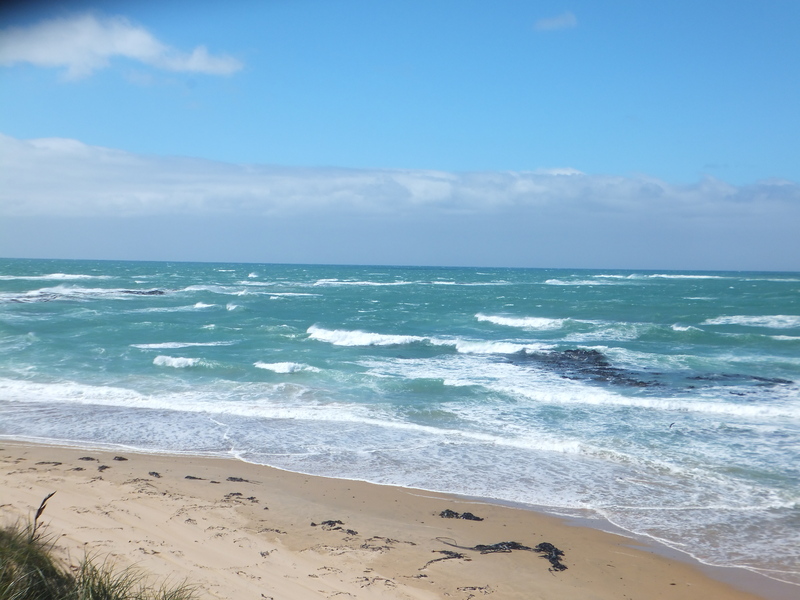 We took the scenic coastal route through the Catlins, winding up and down through forests and then along the coast. It was certainly very beautiful, and pretty empty, just hills and sheep and birds (including Yellowheads). 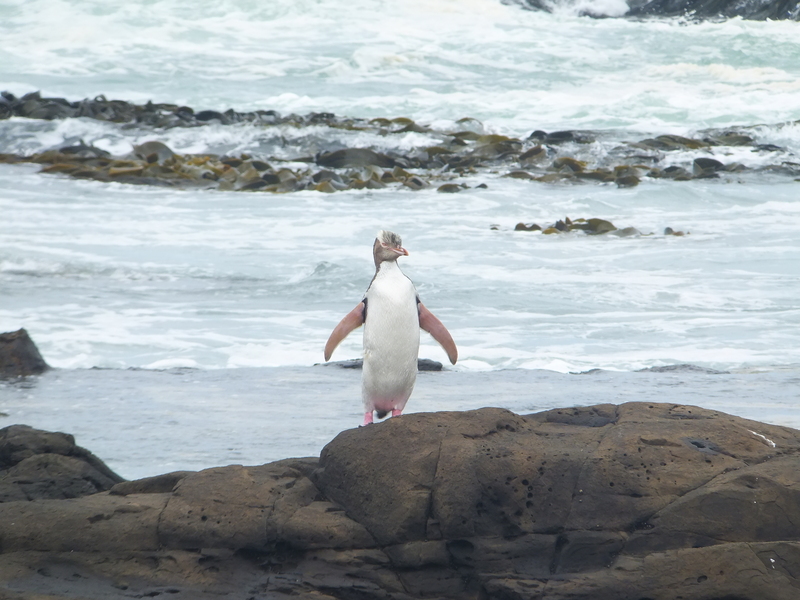 We stopped off at a couple of places of interest, Waipapa Point, and Curio Bay, where there is a fossilised forest, and where Yellow-eyed Penguins nest. These are some of the world’s rarest, so we were very pleased to see a few trundling about on the shore. And finally Nugget Point. We had decided not to stay in Dunedin, famed for its art deco architecture, but to go out along the Otago Peninsula to Portobello. After supper we drove to Taiaroa Head, where there is a viewing platform to watch Little Blue Penguins coming back from the sea to their nests. They are tiny, only about 40-45cm tall. They came in at first in ones and twos, then in batches of maybe 30 or 40, the sea boiling as they all raced in, and then jumped and bounced up the shore, passing very close to and even under the viewing platform. 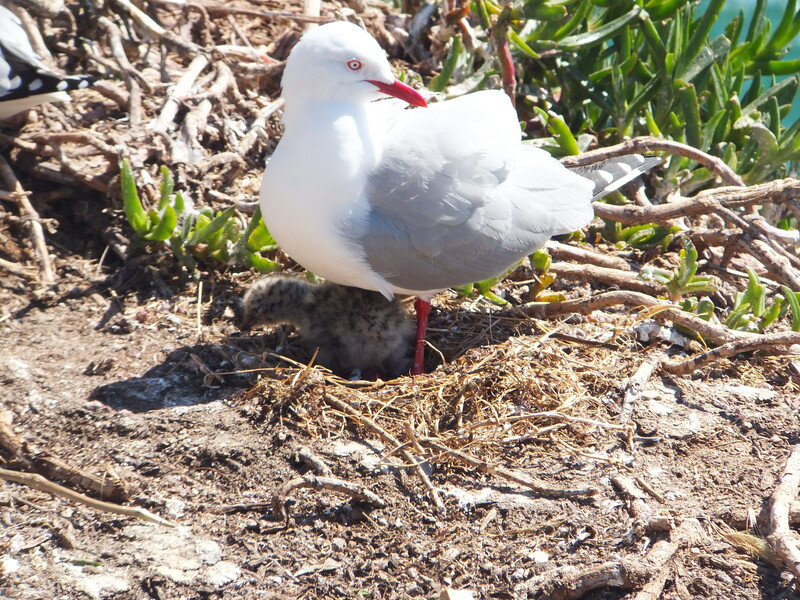 The next morning we took a tour at Taiaroa Point again, this time going past the nesting sites of Red-billed Gulls, where we saw lots of fluffy grey chicks, and up into the Albatross area. We spotted five Northern Royal Albatrosses on their nests, and, as we were on our way back to the car, one soared above our heads and came in to land. 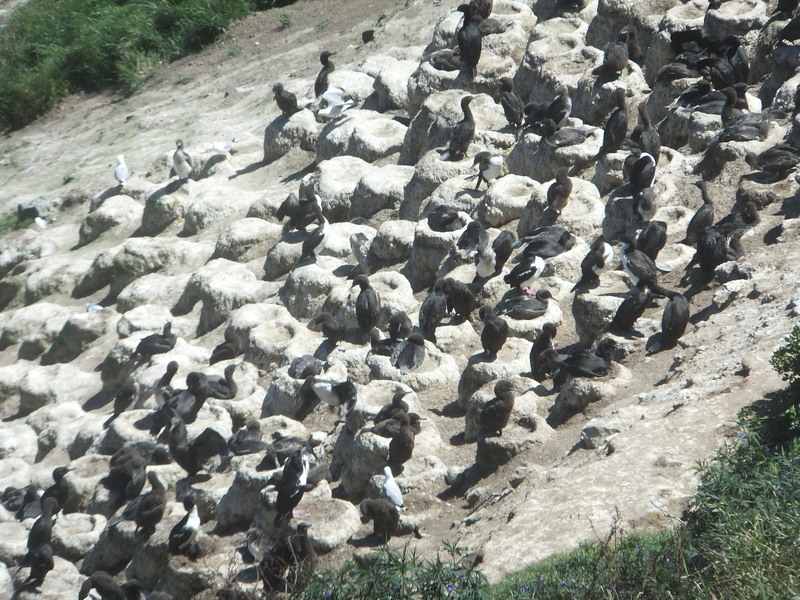 There were also three different kinds of Shag nesting on the cliffs, so the sky was busy with birds, everything smelt of fish, and there was a constant screeching of gulls. 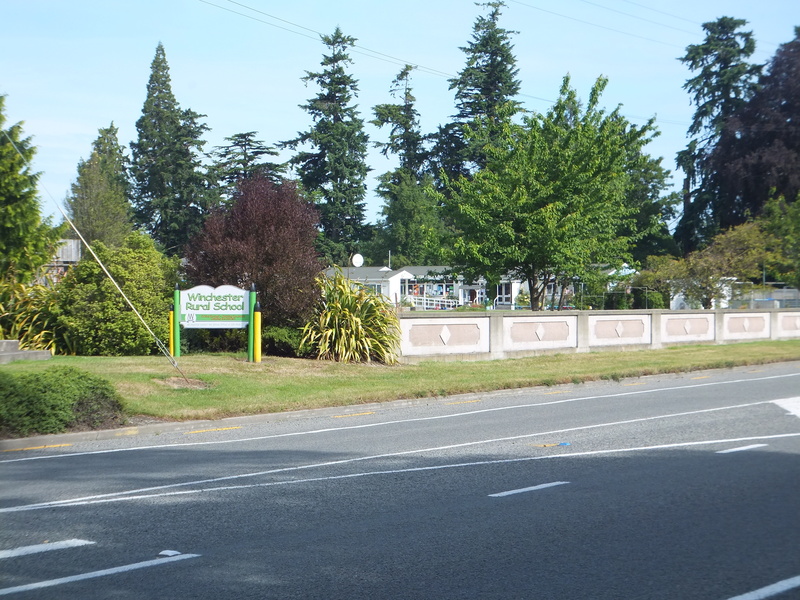 The drive to the outskirts of Christchurch was long but not difficult, and took us via Winchester., where we stopped to take a couple of photos. We arrived at Pete and Joan’s place at about 6.30 in the evening. They have a very pleasant house on quite a bit of land in a smart suburb of Christchurch, with a few sheep and a couple of donkeys, Oliver and Smoky, to whom we were introduced. 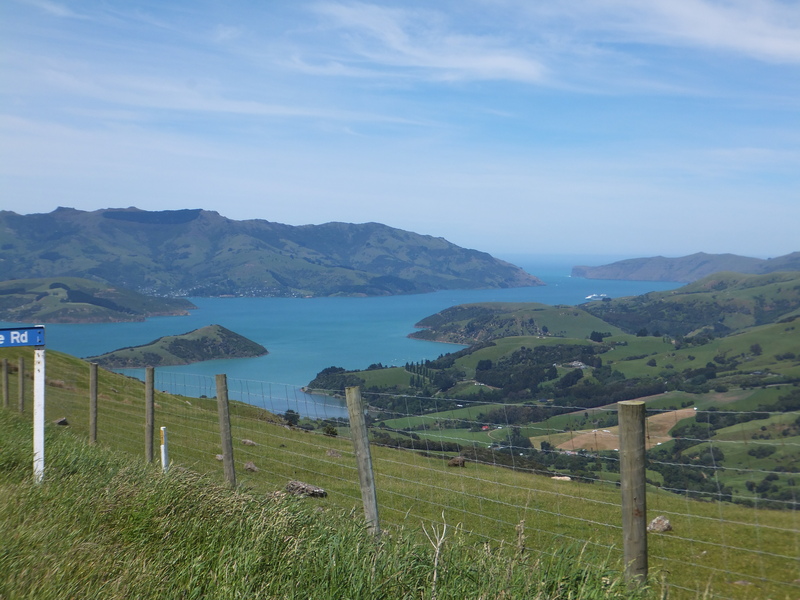 Pete and Joan both work, so we took ourselves to the Banks Peninsula, driving along the spectacular summit road round the rim of the extinct volcano. 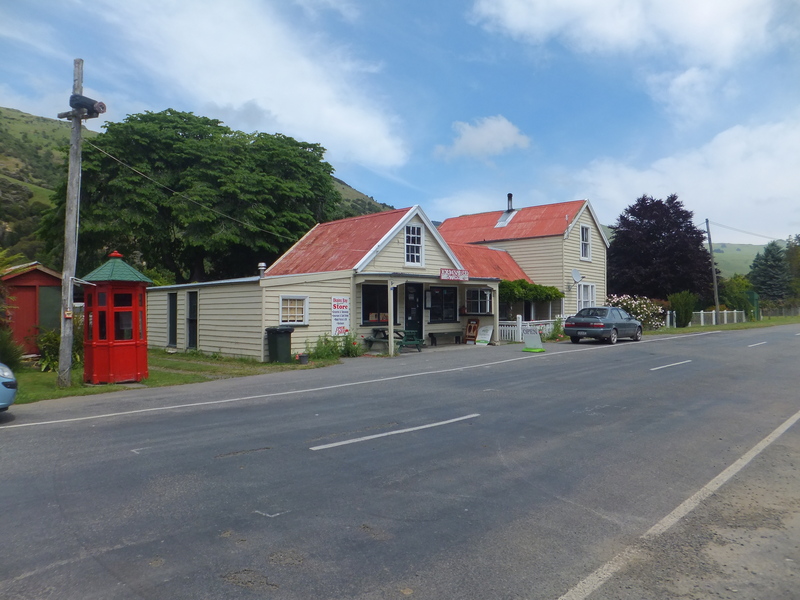 We drove down to Okains, a small village at the end of one of the run-off valleys where there is a museum of Maori and colonial history. 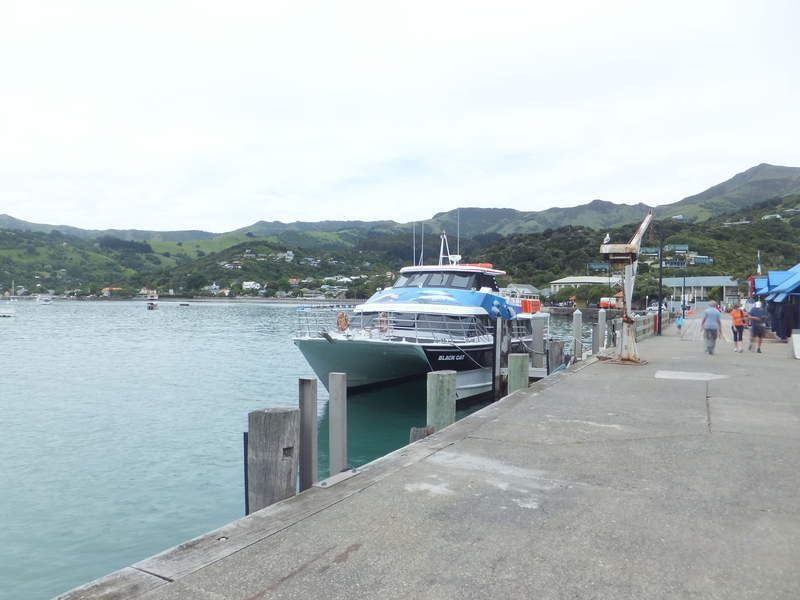 Then we climbed the hill again, and continued to the main town, Akaroa, a pretty place in the caldera where we walked round the shore and browsed in the shops. On the Saturday we were due to fly on to California after a lovely 3½ weeks in NZ. 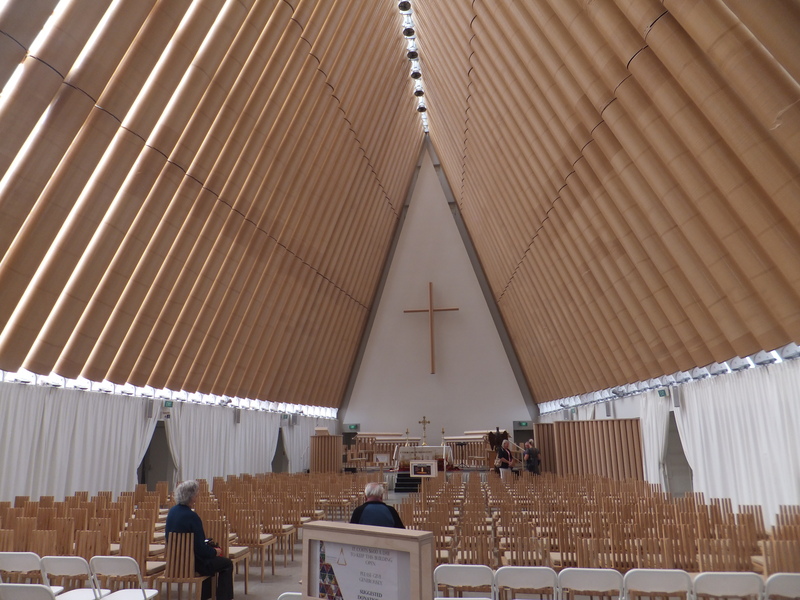 We dropped our car off, having driven getting on for 3,000 kms, and then Pete and Joan took us into Christchurch. 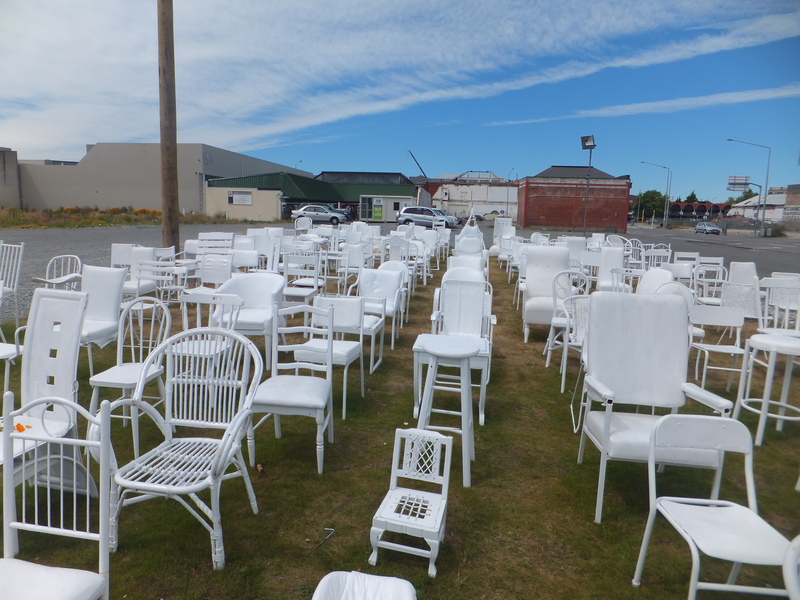 (it’s made of metal and reinforced cardboard in fact) and the memorial to the dead: 189 empty chairs, all different, all painted white, on a piece of empty ground. We drove round the coast, too, and saw houses right on the edge of or toppled off cliffs. 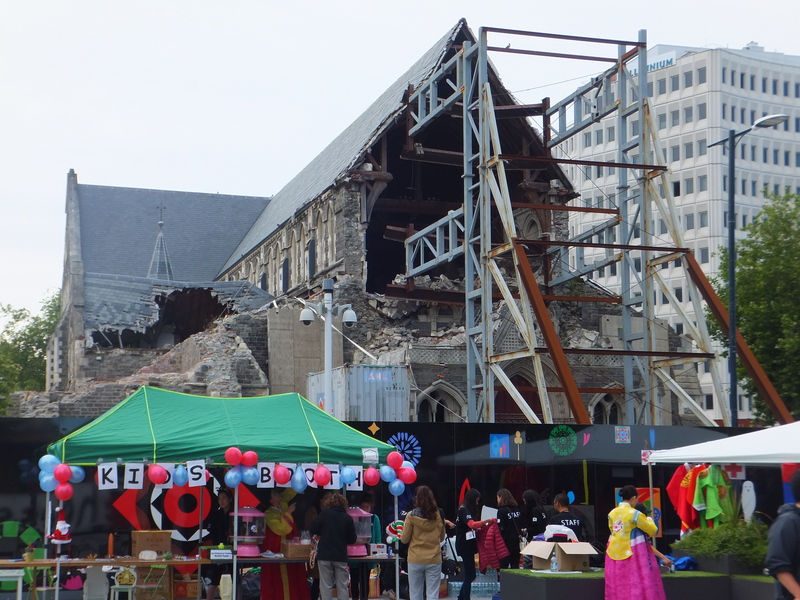 It was all very sobering, but the city is quite lively now and there is a sense of hope. After lunch there was a bit of a dash to the airport, but luckily our flight was an internal one, to Auckland, so we thanked Pete and Joan for their generosity and set off on the final stage – to California.